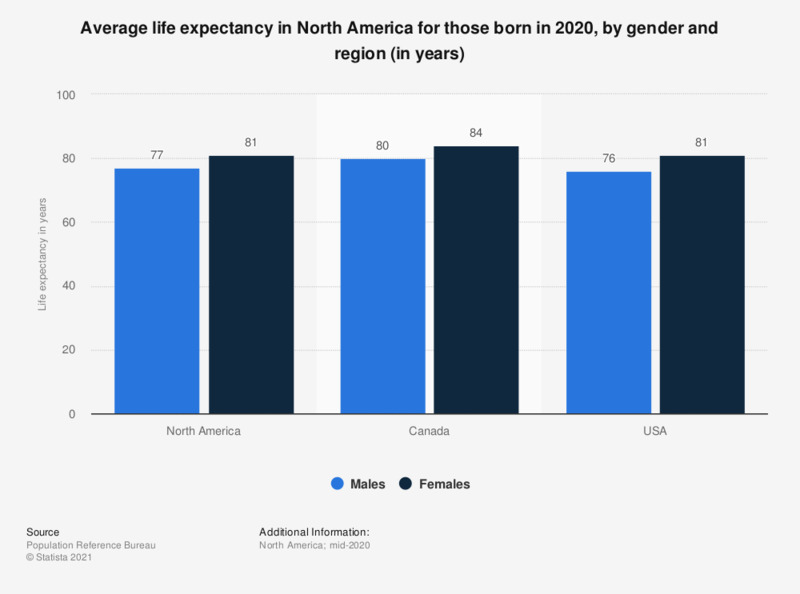 The statistic shows the average life expectancy in North America for those born in 2018, by gender and region. In Canada, the average life expectancy was 80 years for males and 84 years for females in 2018. Of those considered in this statistic, the life expectancy of female Canadian infants born in 2015 was the longest, at 84 years. Female infants born in America that year had a similarly high life expectancy of 81 years. Male infants, meanwhile, had lower life expectancies of 79 years (Canada) and 76 years (USA). Compare this to the worldwide life expectancy for babies born in 2018: 74 years for women and 70 years for men. Of continents worldwide, North America ranks first in terms of life expectancy of (77 years for men and 81 years for women). Life expectancy is lowest in Africa at just 61 years and 64 years for males and females respectively. Hong Kong SAR is the country with the highest life expectancy worldwide for babies born in 2018. Life expectancy is calculated according to current mortality rates of the population in question. Global variations in life expectancy are caused by differences in medical care, public health and diet, and reflect global inequalities in economic circumstances. Africa’s low life expectancy, for example, can be attributed in part to the AIDS epidemic. In 2015, around 180 thousand people died of AIDS in South Africa, the largest amount worldwide. Nigeria, India, Tanzania, Mozambique and Kenya were also high on the list of countries ranked by AIDS deaths that year. Likewise, Africa has by far the highest rate of mortality by communicable disease (i.e. AIDS, neglected tropics diseases, malaria and tuberculosis). * Average life expectancy of a newborn according to the current mortality rate. DSW = Deutsche Stiftung Weltbevölkerung (German foundation for global population).